How clean is your travel toothbrush? Have peace of mind with a cleaner brush while on the go! Cleaner Bristles On-The-Go Antibacterial* bristles stay cleaner between uses. Antibacterial* bristle protection for up to 60 brushings. The Dome Trim bristle design cleans below the gumline where gum disease starts. 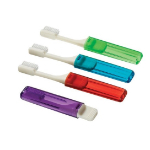 The ergonomic cap promotes comfort and stability while brushing. *Bristles have a patented Chlorhexidine antibacterial coating for continuous bristle protection during the recommended life of the brush. Bacterial growth that may affect the bristles is inhibited. The Chlorhexidine on the bristles does not protect you against disease. As always rinse your brush.